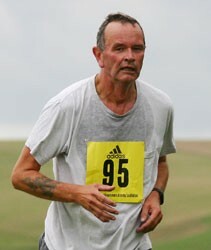 I managed two short runs while away at Tolpuddle. On the Saturday morning I went west and then along a bridleway. On Sunday morning I went in the opposite direction, through the village, and spied a footpath that was supposed to go to Affpuddle, though alas it was blocked. Instead I stayed on the road and ran to the top of the hill, where i saw a fox emerging from the wood.